Hi there fellow fans of old time special photographic effects. It's time for another examination of traditional hand made trick shot magic from days gone by, and in today's case, days VERY long gone indeed. Just before we embark on today's dusty trail I'd like to put out a request on behalf of the family of former Selznick International Pictures matte artist, Spencer Bagtatopolis. Spencer was active in the matte department from the mid 1940's and painted memorable shots on such high profile classics as DUEL IN THE SUN, THE PARADINE CASE, SINCE YOU WENT AWAY (illustrated here), PORTRAIT OF JENNIE and others. He also worked for RKO on several TARZAN adventures and later on for a time at 20th Century Fox in addition to being a well known gallery painter. A book on Spencer is in advanced stages of completion, based largely upon letters and scrapbooks belonging to Spencer's widow, though the biographer tells me that the historic timeline largely dries up just before Bagtatopolis began his matte shot career, aside from several old photographs of some of his matte paintings. In the unlikely event that any of our readers have any information that could be of help please let NZPete know and I'll forward same to the biographer who would be most grateful. I've forever been a great fan and follower of that most American of motion picture genre's: the western. You just couldn't find anything else that's so quintessentially part of the fabric that makes up their identity. I couldn't even guess at just how many cowboy pictures I've seen over the years, and continue to see. There have been so many great cowboy flicks over the past 80 odd years of Hollywood, with evergreen titles such as THE SEARCHERS, JOHNNY GUITAR, THE HIRED HAND, TRUE GRIT (the original of course), THE WILD BUNCH, HIGH NOON, BAD COMPANY, THE COWBOYS, SOLDIER BLUE, THE BALLAD OF CABLE HOGUE, EL DORADO (a fave of NZPete) and a couple of recent titles such as Quentin Tarantino's wonderful THE HATEFUL EIGHT and another recent little known, though excellent, low budget Kurt Russell western with a genre twist, the utterly brilliant BONE TOMAHAWK which I can't recommend highly enough. Rarely have I seen a film from this genre with such beautifully crafted dialogue and characterisations. One for repeat viewing in my book. See it, or face the eternal wrath of NZPete! 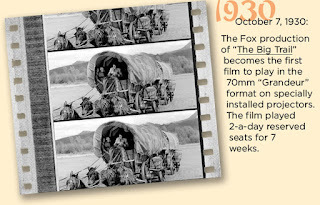 The Fox Studios went all out with promotion in 1930. 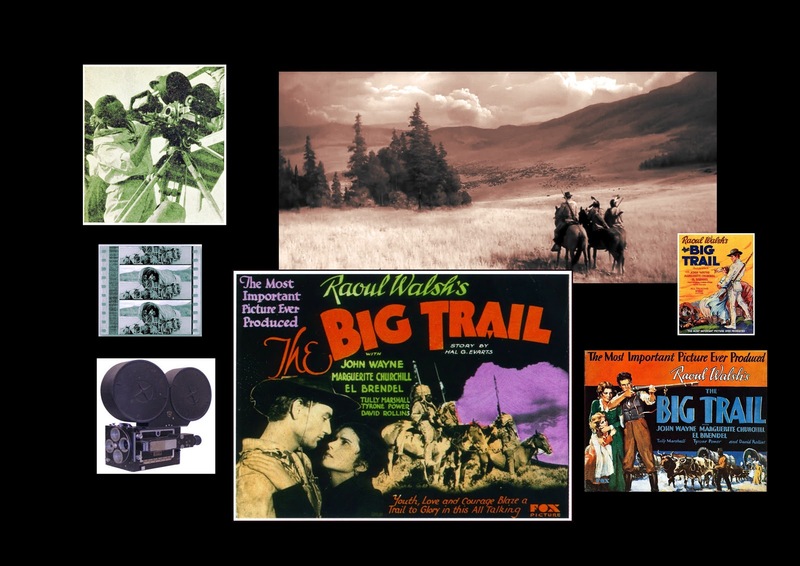 Today's retrospective looks at one of, if not the earliest of the epic western films Raoul Walsh's monumental THE BIG TRAIL produced by Fox in 1930. 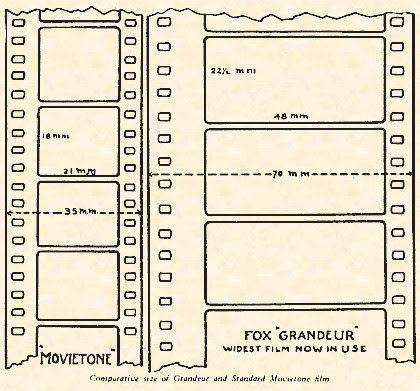 The film is exceptional on a number of levels, not the least being the ground breaking use of the then revolutionary new wide screen process known as Grandeur which would see 65mm negative being utilised for one of the first feature length motion pictures. It had been used experimentally on a couple of short subjects in 1929 and on one full length 'musical', which oddly was silent and had the lyrics etc on intertitle cards as the performers 'sang' their hearts out (!) I'll talk more about the Grandeur Widescreen Process shortly. As a movie, I'd regard THE BIG TRAIL as one of the best westerns ever produced. It just hit's the mark for me on every level and even some ninety years on still seems relevant and barely dated (aside from the clunky direct sound recording unavoidable of the period). The story revolves around a large wagon train of settlers crossing vast expanses of the American wilderness in search of a fresh life, complete with hardship, confrontation, betrayals, Indians, births and the inevitable deaths - the exact sort of narrative one might feel could be seen as 'cliched' but with the difference that this film did it all first. The film succeeds in large part by an impressive ensemble cast where no one figure dominates the proceedings and all players get to shine in their own way with the many inter-relationships and much drama. As a confirmed fan of John Wayne, it is a real thrill to see The Duke in his first lead billed role, though as I say, no one character takes precedence over the others, not Wayne who was yet to find true 'stardom' with John Ford a few years later. THE BIG TRAIL is really one of the most honest and truthful westerns I think I've ever seen. The entire two hour saga is told in an almost documentary fashion, with the Grandeur cameras merely observing the goings ons, and mostly in an unobtrusive manner. 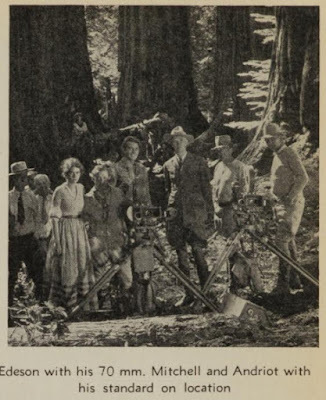 I give director Raoul Walsh full credit here for bringing the proceedings together so well and so credibly, The entire picture exudes a 'you are there' feel the whole way through, with barely a slack moment nor a wasted frame. Anyone who enjoys a really good western should do themselves a service and see this film. Technically the film is incredible. The aforementioned Grandeur 70mm (sometimes known as Fox Grandeur) wide-screen photography is stunning. 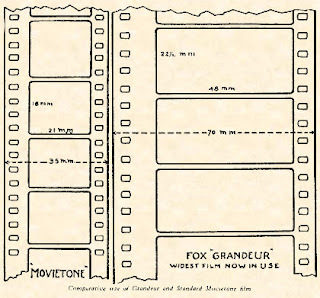 Incidentally, the film was shot in dual formats - 70mm by cameraman Arthur Edeson as well as standard 35mm Academy ratio by associate cameraman Lucien Andriot - in order that Fox could ensure bookings at all movie houses regardless of projection equipment. At the time of it's initial release there were only two venues in the US that could exhibit the Grandeur prints - Graumans Chinese in Los Angeles and The Roxy in New York. Apparently the two versions as well as having the obvious compositional differences are also slightly different editorially. 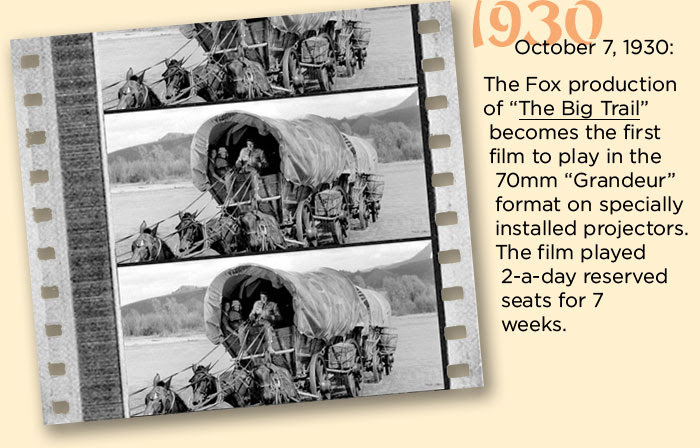 I understand that later on Fox made optical reduction 35mm prints so as to retain the full 2.2:1 image to enable screening in any cinema. Other studios experimented for a time with the large 70mm film format such as United Artists with the very strange THE BAT WHISPERS also that same year, though this variant was billed as 'Magnafilm'. 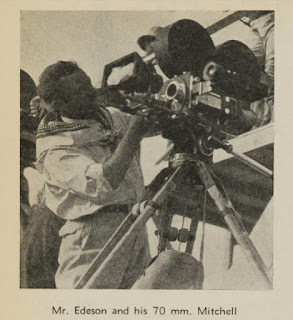 In the very interesting American Cinematographer article published in September 1930, cinematographer Arthur Edeson explained in detail the trials and tribulations of shooting on this new format. 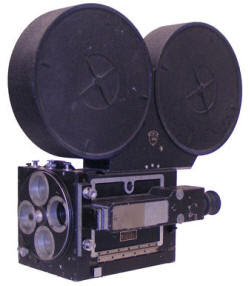 Said Edeson: "I had the typical conservative cameraman's attitude toward wide film. It might be alright as a novelty, but as a practical medium for serious artistic work it was impossible. Everything, especially the new proportions of it's picture seemed absolutely wrong. Since then I have spent more than six months photographing the 70mm version of Raoul Walsh's THE BIG TRAIL and in this time I have shot hundreds of thousands of feet of Grandeur film and the results have convinced me that I, and not the process, was wrong. Now that the production is completed, I know that I shall find it difficult indeed to return to the cramped proportions of our present day standard film. For 70mm photography has given me an entirely new perspective. Instead of regarding things in the old, cramped Movietone frame, I now see them, photographically, as my eye naturally perceives them - in much the same proportions as the low, wide Grandeur frame". The article goes on to explain the technical hazards that Edeson was confronted with: "Another troublesome detail for which we found a sure cure was that of film curling and buckling. A buckle in a 70mm camera is a terrible thing, for it not only ruins a large quantity of valuable film and often damages the camera, but it invariably makes the motor a total loss. During our our first week's work on the picture we had several bad buckles - which meant new motors every time. Naturally this was serious and it couldn't be allowed to continue. So we spent all of our energies toward finding a cause for these buckles. Eventually we found it to be caused by friction between the edges of the film and the magazines. After that we took special pains in film loading, making sure that every roll of film used was absolutely true to it's spool, with no chance of touching the walls of the magazine". Interestingly, neither Director Raoul Walsh nor Cinematographer Arthur Edeson saw so much as a single exposed frame of the film during production as the unit was constantly on the move across many locations and it would be some five months until either party could see any of the footage when the unit returned to Hollywood. Not an uncommon aspect of shooting epics on far flung locales as I recall Director David Lean and Cinematographer Freddie Young experienced similar artistic hurdles when filming LAWRENCE OF ARABIA with both having to rely upon daily telegram reports from Technicolor Laboratories in London in order to know that the exposed footage was free of scratches or accidental fogging. As this is a special effects blog, THE BIG TRAIL is noteworthy as having a generous number of matte painted shots with scenic enhancements and moody atmospheric effects. The film has no special effects credit though there is screen credit 'Settings by Harold Miles and Fred Sersen'. Miles was an Art Director on many films while Sersen, as all of my readers will know by now was a legend in the visual effects community from the early 1920's through to the early 1950's having started off in glass shot work in the 1920's before becoming chief of all special effects at 20th Century Fox. Just recently I was in contact with family members of Oscar winning effects wizard John P. Fulton and I was informed that John's father, Fitch Fulton - a well respected matte painter - worked on the matte shots for THE BIG TRAIL. 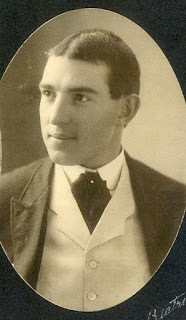 Fitch began as a scenic backing painter in vaudeville theatres and it was at the urging of his son John, who himself had just been given the headship of Universal's special effects department, that Fulton senior try out his artistic talents in the motion pictures. 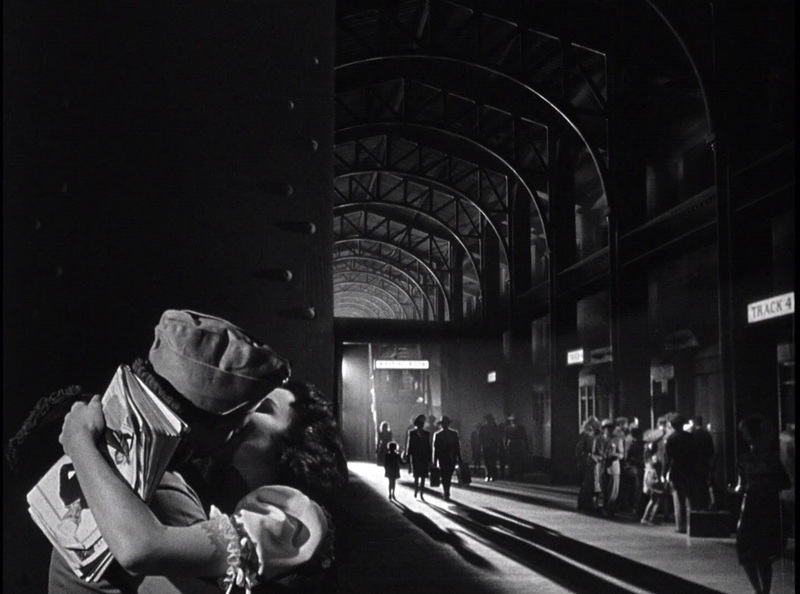 Later Fitch would work again with Sersen as one of 20th Century Fox's regular matte department artists through the thirties and beyond and would also provide much wonderful matte artistry on films such as Fox's HOW GREEN WAS MY VALLEY; David O. Selznick's GONE WITH THE WIND as Jack Cosgrove's primary matte artist where something of a record was set with the sheer volume of 3-strip Technicolor matte shots, and most of them being on original negative to boot; CITIZEN KANE over at RKO, a stint with Larry Butler on the big Korda Studio's Rudyard Kipling adventure JUNGLE BOOK where Fitch painted many wonderful Academy Award nominated Technicolor mattes of steaming jungles and lost temples (for more on that topic, stay tuned for a special forthcoming blog on Painted Jungles with just about every matte I could find on the theme... Pete). In the late 1940's Fitch headed the matte unit on what would become the Oscar winning effects showcase MIGHTY JOE YOUNG. Odd fact: Both John and Fitch had films up for the Best Visual Effects Oscar in 1949 - TULSA for John and MIGHTY JOE YOUNG for Fitch. According to John's daughter, her father had something of a falling out with her Grandfather when Fitch's film took the effects Oscar over John's film that year (!) Talk about family rivalry. Fitch didn't even get the Oscar (nor was he expected to) as it was awarded to Willis O'Brien as overall special effects supervisor, and Fitch was but one of four matte artists on that big film...... though as usual, I digress. Effects artist Fred Sersen (centre) with his matte painters preparing in camera glass shots on the Fox lot probably in the early 1930's. I've always wondered about this photo as the glass work closely resembles some of the shots seen in THE BIG TRAIL. The mattes in this film look great. Some are just 'top ups' to an existing location and others are full paintings. I'm inclined to think that many may have been in camera glass shots, painted and photographed right on location such is the extraordinary clarity and high fidelity of certain mattes. These were certainly common at the time the film was made. Others may be mattes in the true sense of the term whereby part of the frame has been masked off and a held take made with the cast, with the painted element added sometime later back at the studio. Some shots barely exhibit a soft matte line while others are flawless blends of painted and real. The visuals for the most part look original negative and must have looked terrific up on the big screen back in the day. The BluRay edition looks magnificent. I'm a sucker for old time hand painted title cards. Absolutely a lost artform. No effects credit, though I now know that Fitch Fulton was matte painter on this production and most likely worked under Fred Sersen - himself an experienced matte artist. No, that's not the Tyrone Power you might think ... rather it's his father. Upper half of the frame is painted. Trees, sky and moon. This appears to be a matte as there is a soft line running across the scenery just above the wagons. A stunning vista courtesy of Fitch Fulton and Fred Sersen. Love that sky very much. Distant hills and sky painted in. Again, what seems to be a matte extension with entire horizon and sky added in. Just look at the fidelity of that 70mm photography. The rising dust from the horses passes behind the matte line or painted glass (I suspect the latter). Although not at all related to this film I'm reminded of one of my all time favourite Duke Wayne lines, from THE UNDEFEATED made in 1969. Right after Wayne suddenly guns down a slippery looking cowpoke, a very prim and proper Baptist lady utters: "But why did you have to shoot that poor man?" Duke's reply, in classic Wayne style: "Well, the conversation kinda dried up". Always cracks up NZPete. Am I digressing? A full painting with superimposed rising smoke element. 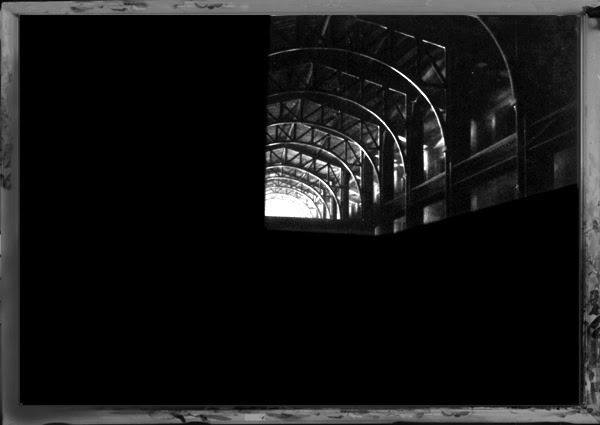 The photographic process may be called Grandeur but I think the matte artist adds just as much grandeur. Not a visual effect, but the most beautifully staged and photographed sequence in the film, with opposing gunmen on either side of a fallen tree in the snow. Pure poetry. 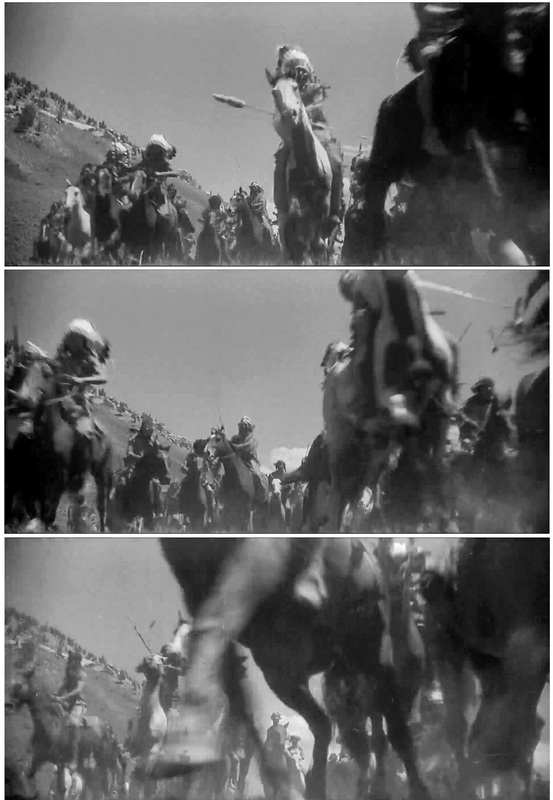 This stunt footage must have shaken up audiences back in 1930 with the near stampede of horses hooves right in the viewer's lap. Not sure here but the sky is quite likely a painted augmentation. Sad sequence this as they bury their loved ones. Nobody ever said this journey was going to be easy! A beautiful matte shot that's so evocative of the thirties photographic effects style that NZPete is so partial to .... Love it! ... and this is the latter where this matte shot doesn't show up in the 70mm version for some reason? Yes, yes ... I know ... any excuse to show the rather fetching Marguerite Churchill. You don't like it? ... So sue me. My favourite matte from THE BIG TRAIL ... Magnificent, moody and malevolent . Matted in upper section of frame including tops of wagons, mountains and sky. Great composition and integration of painted and real elements. The frame grabs aren't very good but it's a doozy of a storm with animated lightning bolts and so forth. Curious cloud design with one looking like a scarecrow in this dramatic skyscape. Interestingly, in examining the matte sequences numerous times there isn't a one that has any evident matte line jiggle that I could detect (and I always look), not even when they cut away and come back. Often in many shows I find that grabbing matte frames from the same shot either side of a 'cutaway' it's not unusual to toggle through the frames and see dramatic matte shift where the join or painting suddenly seem slightly out of register. 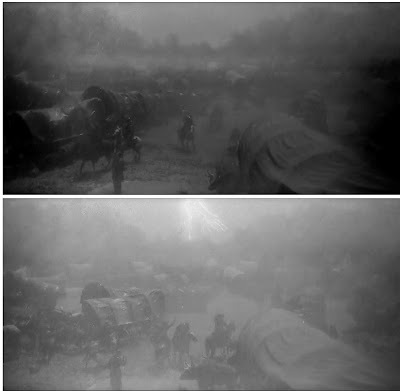 This isn't detectable usually when seeing the film in regular 24fps but is when viewing still frames as described here. I've never figured out why this occurs?? My other favourite glass shot in the film. So beautifully painted and above all blended with the live action with such crisp resolution that it just had to be a traditional foreground glass shot on location. Mostly painted, and again, perfectly blended into the live action. Give me this over the CG variant any day of the week friends. And so endeth our cinematic journey along the big trail. Two ace cinematographers side by side on location with their respective camera equipment.